Spunky and energetic, Kellie Skater is one of the exciting ladies leading the charge of Australia's burgeoning women's wrestling division. Technically oriented with a healthy dose of high-flying acrobatics, Skater is a favorite of the fans Down Under. That is...except when her alter-ego, The Rate Tank, makes her appearance. Then the rulebook takes a vacation as this lady utilizes whatever means necessary to stomp, choke and pummel her way to victory! It's not unusual to see the high-flying Skater leave the mat during her matches. As The Rate Tank, Skater becomes much more aggressive as she throws the rulebook out the window. You'll be seeing more of this in the future: Kellie Skater leaving the ring with another title belt! The Rate Tank is ready to rumble! Skater locks in a punishing camel clutch. How It Started: I've been a wrestling fan since I was a little kid. Being a wrestler was basically the only thing I ever wanted to do. I got a pretty good break in that I met one of the other Vic women's wrestlers at a party and she could tell I was passionate...so she invited me to train with her. I started training at the end of January '07 and debuted that March in a battle royal. Some of my trainers include George "Hitman" Julio and Mike Burr/Mike Manson (Alpha). Gimmick: My main gimmick is being a good-sportswoman and the good girl who just wants to wrestle. I'm very friendly before/after the match but once the bell rings it's all business! I tend to be honourable, making a lot of saves and offering handshakes. That tends to get me jumped a lot...but that's okay. I can take a beating and once I'm back to my feet I'll give back as good as I got! In QLD I wrestle as a cocky/aggressive jerk with the self-given nickname The Rate Tank. I believe that I am a massive tank and indestructible. Some may say I'm delusional. I definitely have a mean streak in me in QLD, always aiming to make my opponent my next victim of my submission finisher. Wrestling Style: Fairly hard hitting with some high flying mixed in. Gear: My most common gear is white boots, black shorts with fluro green and pink trim, with "skater" written across the back in fluro green/yellow/pink and the Japanese symbol meaning "To excel" written on the side. I wear white wrist tape with a written message depending on the match. Titles Held: Former PWWA Champion. Biggest Win: My biggest win would definitely be when I beat Vixsin in May '08 to capture the first PWWA Championship. It was a pretty stiff, solid match with both of us taking some big spots and giving it our all. I think the intensity was quite high as both of us just wanted to prove ourselves worthy of being the first champ for the first all-female company in Australia. Worst Loss: Losing a Last Woman Standing match to Sway. Not only did I walk out with a loss, but also with a blood-soaked body needing a few stitches in the head! Favorite Type of Match: My favorite type of match to participate in is a singles match because you rely on yourself to get it done and you don't have to worry about more than one person jumping you! I also quite enjoy Falls Count Anywhere matches, as you can take the insanity anywhere in the building. Favorite Moves/Holds: Reversal of sidewalk slam into a reverse DDT; superkick; flying forearm/forearms in general; springboard back elbow. Finisher: "Skate and Destroy" (Yoshi Tonic/Code Red); "Skate or Die" (reverse Indian Deathlock submission into a bridge while locking the opponents arms in a double arm underhook and wrenching). Biggest Allies: The Brotherhood (Mason Childs, Mark Davis, Sorrow and Sway). Most-Hated Enemies: The Pink Ladies (Madison Eagles and Jessie McKay); Tenille Taylah; Vixsin. Toughest Opponent(s): All the girls mentioned in my enemies list are pretty tough. But I would have to say Sway in particular, due to the violent matches we have had in the past. Career Highlight: PWWA Title match vs. Vixsin...a good hard match. 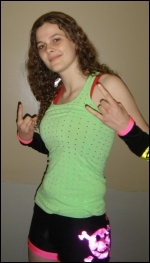 Also, my 12/2008 PWAQ match where I had a chance to wrestle Sara del Rey. Great learning opportunity with a wrestler I highly respect. Wrestling Ambition: To train for, and then wrestle in, Japan. I'm a pretty hyperactive person.....I've been playing sports since I was a little kid. I played beach volleyball for quite a few years, won a few mixed 4's premierships and best and fairest, also ended up umping for awhile.....I really enjoy hanging with my mates from inside and outside of wrestling.....I have a trained pet Lorrikeet called Laurie. He's the man!.....I also have a pet dog called Nattie, some birds out the back of the yard and evil chickens.....I'm pretty much a nerd: I like comics, video games and movies (go Rocky!). Watch out for the Aussies coming atchu in Sparkle/Shimmer! Aussie fans: come out and support the biggest tournament in Australia, PWAQ's "Rise of the Warriors"...watch out for Brotherhood members Skater and Sway!